Investors are increasingly worried about lack of revenue growth in the US stock market, and investors are always seeking earnings growth. In this time period, where questions of “topping” are more frequent, investors may be seeking lower volatility stocks, just in case things go badly — and retired investors who may be selling shares to generate household operating funds are well advised to keep portfolio volatility low. With those thoughts in mind, we asked which companies had higher revenue growth rates (“RGR”) and higher earnings growth rates (“EGR”) than the market, but also lower Beta than the market, and also better GARP (growth at a reasonable price) attributes indicated by the PEG ratio. 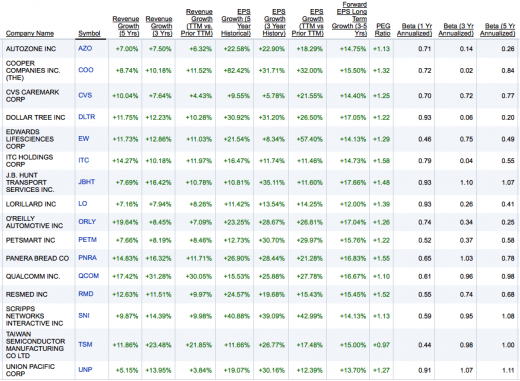 We used the criteria in this table and found 30 stocks that passed the filter. However, wanting some comfort from the careful consideration of recognized independent analysts, we reduced the list further to include only those that were rated by S&P Capital IQ and Thomson Reuters StarMine, and did not receive a rating from either below the level of Neutral. 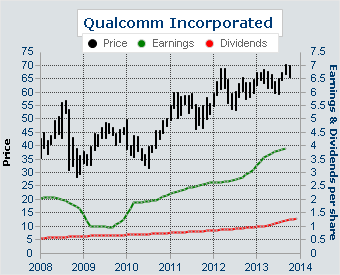 We also required that S&P Capital IQ have opined on Fair Value and did not indicate the stock was overvalued. That knocked the list down to 16 stocks, shown in this table along with the primary filter criteria from the table above (stocks listed in alpha order by symbol). This table provides the yield and 5-year dividend growth rate, worst 3 months total return, and 3-year percent standard deviation (from Principia as of Oct 31). These charts plot the dividend adjusted price of each of the 16 stocks divided by the same for the S&P 500 index ETF (SPY). 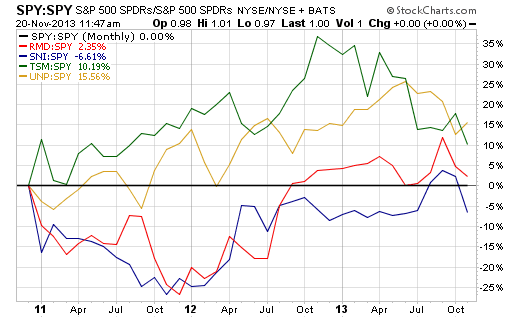 We looked at the companies in terms of financial strength through S&P Capital IQ, Value Line and Wright’s. They were generally in agreement that all of the companies were above average strength to one degree or the other, but had conflicting views on AutoZone, Cooper and Lorillard. For AutoZone Wright’s said the strength was “Limited”, Value Line said “B” which is below average, and S&P said “B+” which is average. Moody’s credit rating is “Baa2”. For Cooper Companies Wright’s and Value Line said financial strength is “A”, but S&P said below average at “B”. Moody’s credit rating is “Ba2”. 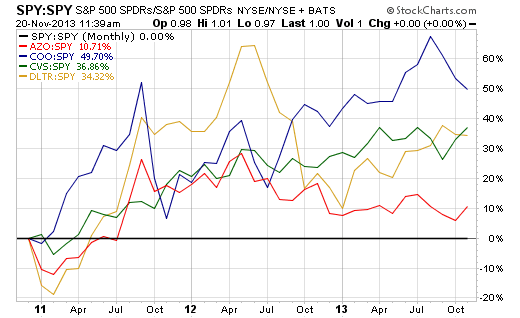 For Lorillard Wright’s said the financial strength is “D” (Fair), while Value Line said “A” and S&P Capital said “A+”. Moodys says “Baa2”. We cross checked the S&P Capital IQ and Thompson Reuters StarMine ratings with Timeliness ratings from Value Line. All three were devoid of negative ratings, except for Taiwan SemiConductor, which Value Line rated 4 on their 5 point scale (where 1 is best). We have positions in CVS, QCOM and UNP from the list above. Dividend and dividend growth are great, and for many investors obligatory, but lack of revenue and earnings growth is a problem. 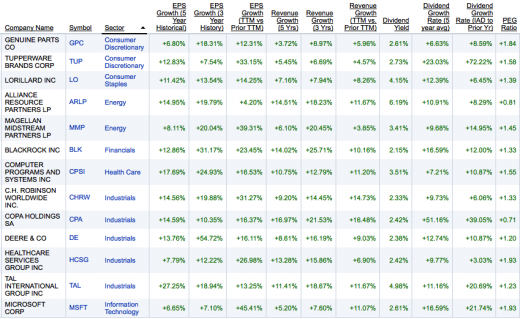 A dividend portfolio needs fundamental growth at the top and bottom line. Without that dividends cannot be relied upon for long. There are slim pickn’s these days, which also lends some weight to those saying the market is more than fully valued, and due for a correction. Only 3/10 of 1% of our stock universe made it through basic filters for historical revenue, earnings and dividend growth, and current yield and forward valuation filters. That doesn’t seem like enough to us for a market that is only “fairly valued”. Let’s see how filtering can give clues to overall market valuation, and what comes out in a prospect list for detailed consideration. There are many other factors to consider in stock selection, but a general filter for growth is a good place to start. With that in mind, let’s look at growth sector-by-sector. 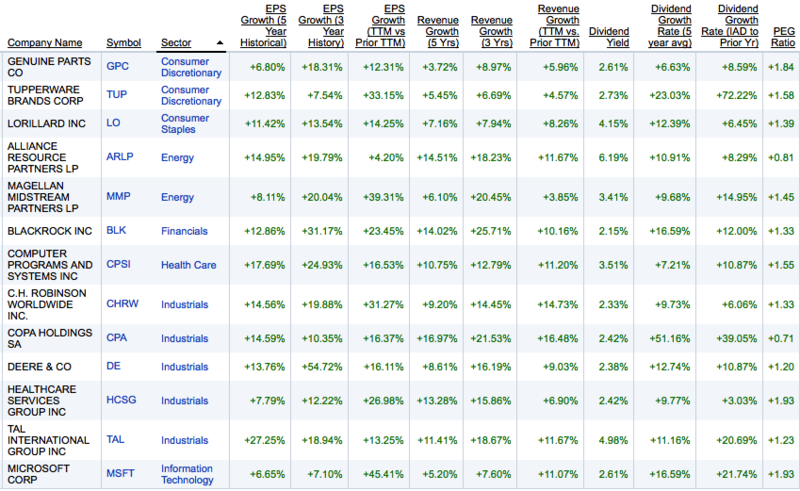 Even if you do not buy individual stocks and prefer ETFs; and even if you do not seek dividends, comparing growth by sector, may be helpful to you in focusing your attention on particular sectors where growth is more prevalent. Using the database available at Fidelity today, there are 4,558 stocks price of at least $5.00 per share and which are available on the New York Stock Exchange or NASDAQ. There are only 1,351 companies (29.6%) with at least 3% revenue growth over 5, 3 and 1 years (1,948 with at least 3% growth over 5 and 3 years, but not 1 year; and 2,116 with at least 3% growth over 5 years, but not 3 or 1 years. Of the 4,558 NYSE/NASDAQ stocks trading at $5.00 or more, 778 (17.1%) had EPS growth of 3% or more over 5, 3 and 1 years (1,368 with at least 3% growth over 5 and 3 years, but not 1 year; and 1,909 with at least 3% earnings growth over 5 years, but not 3 or 1 years). Let’s look at growth by sector – first examining revenue, then earnings. Of course, as conservative investors overseeing accounts in or near the retirement withdrawal stage, we would prefer some yield, to divide our total return opportunity and risk between cash in hand and capital appreciation. By requiring our selections to have a yield of at least 2% (a tad more than the S&P 500), that population of 436 companies that had both revenue and earnings growth of at least 3% for 5, 3 and 1 year reduces to 71 companies (1.6% of the universe). 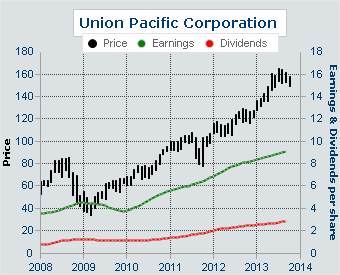 By also wanting our dividend stocks to have some payment history and some growth in dividends as well as growth in revenue and earnings, we added a 3% five-year dividend growth requirement. That reduced the population to 41 stocks (0.9% of the universe). 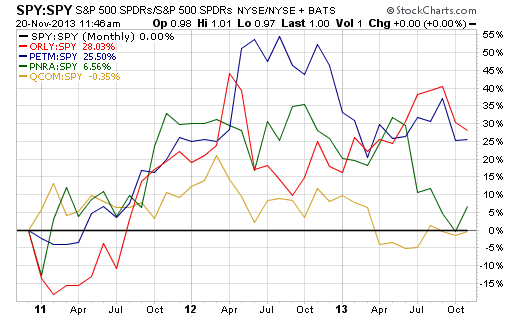 Not wanting to invest in any stocks that recently cut its dividend, we also required that the current year-over-year dividend payment show no decrease. That did not eliminate any stocks. Lastly, we think that general growth at a reasonable price argument makes good sense, so we add a PEG element to the screen limiting the PEG range 0x to 2x (where the zero eliminates negative forward looking earnings estimates). 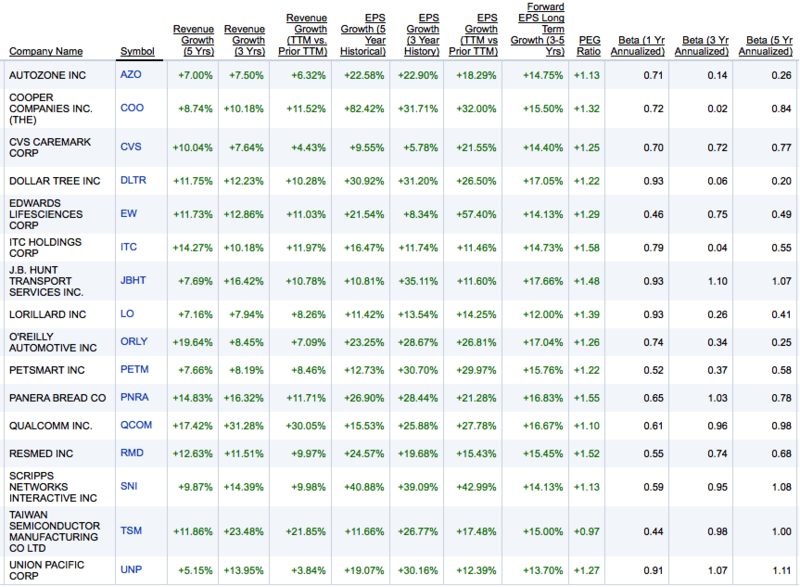 That reduced the list to 13 stocks (0.3% of the universe). These low percentages add weight to the argument that the market is more than fully valued. 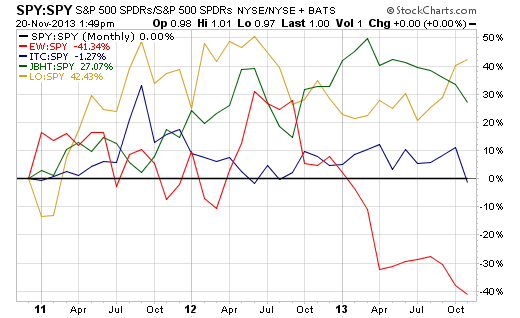 It would seem that a higher percentage of stocks in each sector should be available with revenue, earnings and dividend growth at least a market level of yield, and a PEG ratio of 2 or less – but that is not the case today. This along with other work we do in our monthly newsletter Rational Risk Equity Income Investor, suggests slim pickin’s these days, and that is a gray cloud over the market in our view. With that lucky “13” number (3/10 of 1% of the 4,558 stock universe), we’ll leave the rest to you to see if any other of the filter survivors are attractive and suitable for you due to these and other factors. For those in the withdrawal stage of their financial lives who are also selling shares in addition to collecting dividends (or for those who may be on margin and need more stable prices on those shares on which the margin is based), and perhaps for those fearing a correction in stock prices; paying attention to Beta makes sense. Beta the reactivity of the stock to price changes in the S&P 500 — a value above 1.00 shows that historically when the S&P 500 moved X%, the stock moved more; and a value below 1.00 means it moved less. There are many factors not considered in this article that you should evaluate, from this reduced research list. To the extent that you are interested in the view of independent analyst firms, we point out that neither S&P Capital IQ nor Value Line had any below neutral opinions as to year ahead performance for any of the 13 stocks; and the aggregate opinions of two Thompson Reuters services “StarMine” and “I/B/E/S” also have no below neutral ratings for any of those stocks. 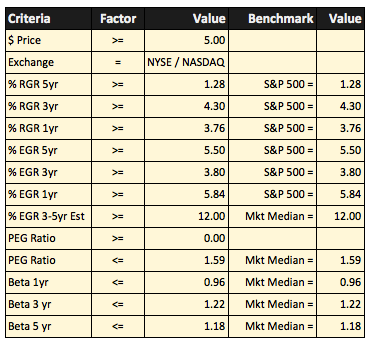 On Fair Value, S&P Capital IQ rated DE, ARLP, MSFT and CHRW as undervalued; and CPSI, HCSG, GPC and MMP as overvalued. Value Line rated DE, MSFT and LO as 1 or 2 (favorably) for Timeliness, and ARLP, MMP and GPC as 4 or 5 (unfavorably) for Technical Condition. 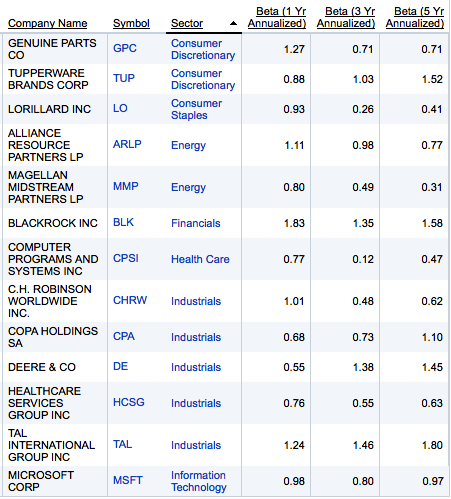 This tabular data based on Thompson Reuters data manipulated with in-house formulas via the Metastock tool shows some important technical condition aspects of the 13 stocks. 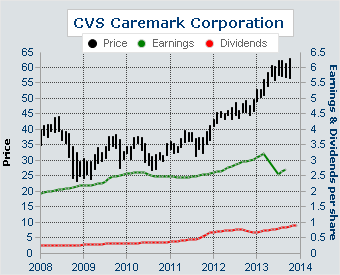 Description of Column Headings: The first column to the right of the company name is the ratio of the market price to the 200-day moving average (greater than 1.00 is preferred). The next column is the ratio of the 200-day average divided by the average 10 days ago (to give a view of the direction of the “leading tip” of the average — greater than 1.00 means “up”). The next column indicates whether the slope of the 252-day linear regression trend line is up or down (1 = up and 0 = down). The next column is the ratio of the 50-day average to the 200-day average (greater than 1.00 is preferred). The next column is the Relative Strength Index (more than 70 is overbought, and under 30 is oversold). The next column titled “Z-score 200” is the number of standard deviations the price is from the 200-day average (0.00 means the price is at the 200-day average — the larger the absolute value of the Z-score, the higher the probability the price will move back toward the moving average). The last column, labeled “Price Channel Position 63” shows where the price is located in the 63-day price range from its high to its low (because the range is defined on the prior day, it is possible for the current price to be above 100 or below 0 — a larger number is closer to the high and a lower number is closer to the low). This table shows the price rate of change (not total return – just price) over several time periods (5, 21, 63 and 252 days, which is 1 week, 1 month, 1 quarter and 1 year). We own BLK, TUP, GPC as of this writing. if less than 3 stocks meet criteria for a sectors only those meeting criteria are selected. This table contains the current yield, 1-year earnings growth rate and price-to-cash flow for the screen selected companies.